To help provide for his growing family, Charles Dickens wrote A Christmas Carol over a period of three weeks in 1843. Creating the characters of Ebenezer Scrooge, Jacob Marley, Bob Cratchit and Tiny Tim, Dickens also made famous the descriptive word "Humbug!" His tale of transformation is still popular during the holiday season and has often been produced for film. This version, from 1984, features George C. Scott as Ebenezer and Frank Finlay as Jacob Marley. In this scene, "Old Marley" (who was "dead as a door nail"), visits Scrooge to warn him about the way he is living his life. Marley, now a ghost, shows Ebenezer how he will end up (if he doesn't make some important life changes). Examining the situation carefully, we can see that Marley—together with the three "Spirits" whose visits Marley announces—have each given Scrooge a gift. Their gifts weren't wrapped in pretty paper and tied with a bow. They were even-more meaningful than something which comes in a package. Each presented an opportunity for Scrooge to see how greed, selfishness and lack of caring about others were impacting his character. 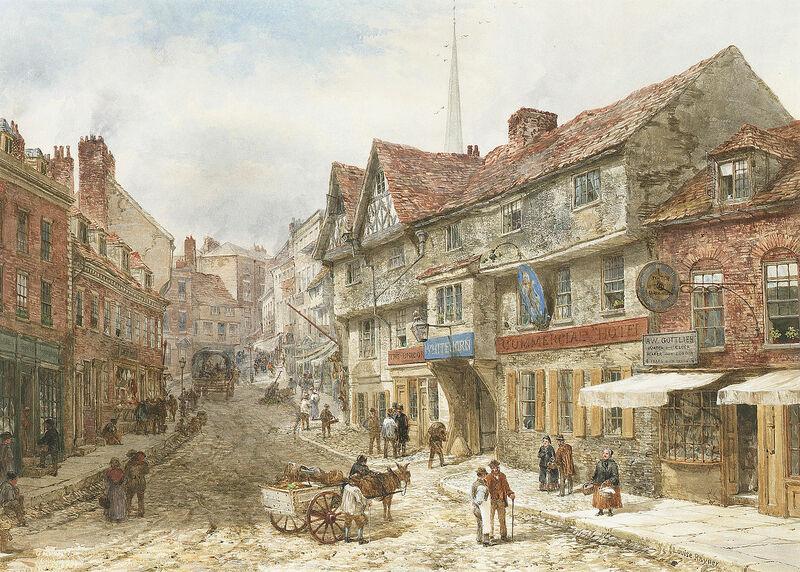 The film was shot entirely on location in Shrewsbury, a quaint Shropshire town (in England's West Midlands), beautifully captured in a watercolor painting by Louise Rayner (1832-1924). In this work of art, the street we see is Wyle Cop in Shrewsbury. The spire, in the distance, is St. Alkmond’s Church. Because of his writings, which were read by Helen Keller's mother, Charles Dickens unwittingly had a profound influence on Helen's life. His story about Laura Bridgman (contained in American Notes) gave Helen Keller's parents some hope that their child (who also could not speak, hear or see) could also be helped. Clip from "A Christmas Carol" (1984) filmed, on location, in Shrewsbury, England. Copyright, Baxter Healthcare (by means of donation from the George C. Scott family), all rights reserved. Clip provided here as fair use for educational purposes and to acquaint new viewers with the production. Bos, Carole "A Christmas Carol - Charles Dickens - Video Clip" AwesomeStories.com. Oct 07, 2013. Apr 23, 2019.